1. This mug is not officially licensed by LEGO, PixelBlocks, Mega Bloks, KRE-O, or K'NEX Bricks. It just happens to be compatible with them all. 2. Can be heated 100 degrees Celsius, but can not put microwaves and dishwashers, recommended hand wash.
3. In order to protect the product packaging without dust,The mug's packaging has a protective film that can be torn off . 4. In order to ensure the transport process is not squeezed deformation, after receiving the goods can fold the edge of the box, and then cover the box, you can make the package will not be opened. 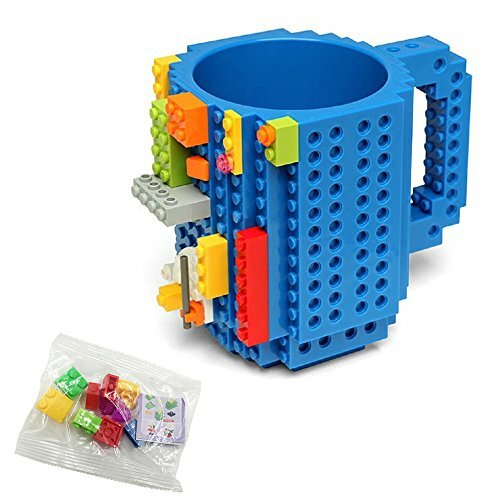 【Creative design, works as a toy and a actual mug】It's a lego-style mug that you can build your own bricks and blocks on it. Easy to make your own unique drinking mug. 【BPA free, safe foods grade plastic】Made of BPA free food grade plastic. Can be heated 100 degrees Celsius. 【Perfect gift for kids and adults】It's a great gift for kids, families and friends, especially who are lego fans. It will absolutely give you great fun! 【Multi-functional】Safe to use for juice, tea, coffee and carbonated drinks. Hand wash only. Not dishwasher and microwave safe. 【Premium Customer Service】1 year Warranty! We sincerely provide fast action at pre-sale service and after-sale service. If you have any questions about this product by Lumsburry, contact us by completing and submitting the form below. If you are looking for a specif part number, please include it with your message.